One million dollars: It was once a huge aspirational monetary goal. However, these days, according to the AARP, having $1 million dollars is almost a necessity if you want to retire comfortably in the U.S.
And that $1 million isn’t per couple, but per individual. So, if you and your significant other are planning a dream retirement in the U.S, you need a whopping $2 million to do it. But we’ll keep it to a simple $1 million here. How long would that $1 million last you in retirement in the U.S? It depends on where you live. For example, it would take you just over 11 years to burn through $1 million if you lived in Hawaii. In some of the U.S.’s cheaper locations, $1 million dollars will see an individual through 25 years of retirement. It is estimated the average American retires at 65, and given that life expectancy in the U.S. is 85, that means you should assume you’ll spend 20 years retired. Based on that estimation, retiring in Hawaii on your $1 million dollar nest egg leaves you out of money for the final 10 years of your retirement. And even in less-expensive U.S. locations, you’ll only just get by on that $1 million…and that’s assuming you don’t live past 85. If you want to retire before 65…well for a lot of people in the U.S., that’s not even an option. But what if you took that $1 million—and your retirement—overseas? That’s where things get interesting. We have pitted three popular U.S. retirement locations against three Latin American counterparts, to show just how stark the contrast can be in terms of how far your money can stretch. Suffice it to say: In the right places overseas, you can not only watch your quality of life expand, but with $1 million nest egg, you could afford to retire young—and stay retired—for about four times as many years as you could in the U.S. But even better: You don’t need anywhere near $1 million to afford a fine—and long—retirement. 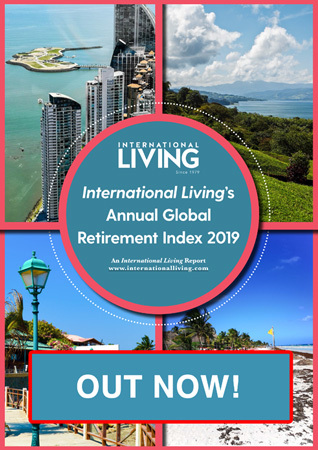 Taking into account the costs for accommodation, utilities and healthcare, we highlight how you can retire overseas for less, and live like a millionaire—without a million-dollar price tag. Located in the Province of Guanacaste, on the Northern Pacific coast of Costa Rica, Tamarindo is a beach community that offers modern amenities and day-to-day necessities, a slower pace and an authentic, laid-back, surf-town feel. With one of the warmest and driest climates in the country, Tamarindo and the surrounding region experiences direct sunlight nearly every single day of the year. Tamarindo has just over two miles of golden sand beach. This palm tree-lined coast is postcard quality, with its pristine blue and turquoise waters that draws sunbathers, yogis, beach volleyball and soccer players, and surfers of all skill levels; there is plenty to do for those seeking an active lifestyle. Kathleen Evans, and her husband Steve, love the fact that they have activity at their fingertips in Tamarindo. “We love the safety of the beach here. It’s a hub for water activities and sunsets at the beach never get old,” she says. To compare: A three-bedroom apartment outside the center of Jackson costs $1,450 a month. Costa Rica has both public and private healthcare sectors. Healthcare costs are about a third of what you’d pay in the U.S. Every town has its Caja (public health) office, where expat residents as well as locals can receive preventative and primary care. Legal foreign residents are required to join the Caja, and pay a low monthly fee based on income, usually starting around $75 per person, although the higher your income the more your payment. After that you don’t pay anything for care, including doctor visits, testing…even surgery. 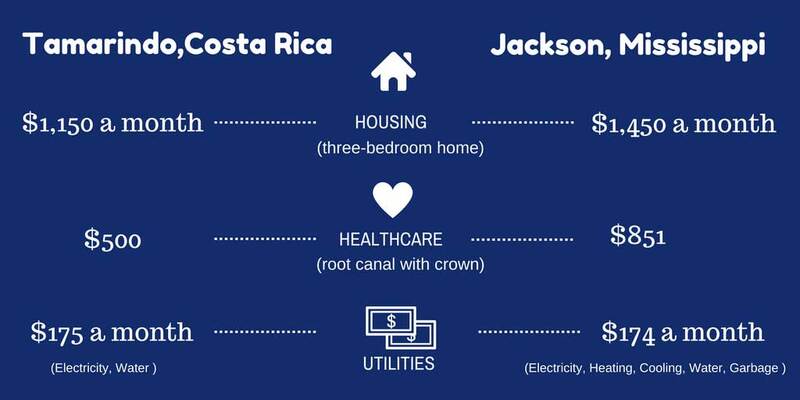 To compare: For a root canal (with crown) in Costa Rica, the most you will pay is $500, compared to $851 in Jackson, MS. That’s a saving of 40% if you get your treatment in Costa Rica. In terms of monthly utility costs, many of the utilities you would rely on in the U.S. are not required in Tamarindo. Monthly utilities of electricity and water for a one-bedroom apartment will average around $175 a month. To compare: Electricity, heating, air conditioning, water, and garbage for one-bedroom apartment in Jackson, MS will cost you $174 per month. The average cost of living for a couple in Costa Rica renting a furnished, two-bedroom apartment, including healthcare, entertainment, groceries, utilities and transport costs is $20,916 a year. Based on that figure, if that same couple had $1 million for their retirement, they could live for 48 years in Costa Rica. Boquete is nestled in the highlands of the fertile province of Chiriquí in western Panama. The little mountain town surrounded by lush green hills, offers a temperate climate and has a lively local cultural and arts scene. The Boquete area, referred to as the “Valley of Flowers and Eternal Spring” is not surprisingly an expat favorite. Many newcomers prefer to rent for a time, and the good news is that you can rent a three-bedroom house for as little as $700 a month in and around Boquete. To compare: A three-bedroom apartment outside the center of Durham rents for around $1,225 a month. Panama offers excellent-quality medical care and modern hospitals in Panama City and other hubs, including Chitré, Coronado, and David. Thanks to Panama’s small size, you are unlikely to be more than an hour from a hospital or upscale clinic, no matter where you live. 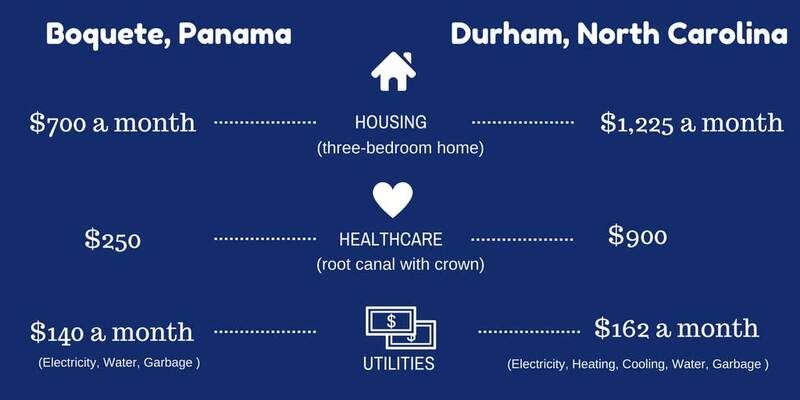 To compare: For a root canal (with crown) in Panama the most you are likely to pay is $250, compare this to $900 in Durham, NC. That’s a savings of 72% if you get your treatment in Panama. No matter where you’re originally from, you’re likely to save here on everything from gas for cooking, to hired help, to power costs (thanks to the perfect climate). One expat says that he slashed his cost of living in Boquete to between 30% and 40% of what it was back home. In terms of monthly utility costs, heating is not required and few use air conditioning in the Boquete region. Electricity, water and garbage collection for a one-bedroom apartment will run on average $140 a month. To compare: Electricity, heating, air conditioning, water, and garbage for a one-bedroom apartment in Durham, NC will cost you $162. The average cost of living, for a couple in Panama renting a furnished, two-bedroom apartment, including healthcare, entertainment, groceries, utilities and transport costs is $20,322 a year. Based on that figure, if that same couple had $1 million for their retirement, they could live for 49 years in Panama. Nestled in the valley between the western and central ranges of the Andes Mountains is Colombia’s second largest city, Medellín. Blessed with perfect year-round spring-like weather and First World infrastructure, it is attracting more and more expats seeking a really high-quality, cosmopolitan lifestyle. “Medellín is truly First World,” says Jeff Raheb of his and his wife Heather’s new home. “We are now living for 30% to 50% less than back home,” says Heather. How much you pay in rent in Medellin will depend on what type of lifestyle you want to have. For example, rent for a three-bedroom, two-bathroom, unfurnished apartment ranges from $400 to $1,000 per month. Expect to pay on average $700 a month. To compare: A three-bedroom apartment outside the center of Phoenix, AZ is around $1,575 a month. Inexpensive and quality healthcare is something Colombia is not short on. According to a recent study by América Economia, eight of the top-ranked hospitals in all of Latin America are located in Medellín. Even if you decide to pay-as-you-go, and not sign up for health insurance, your out-of-pocket costs will be quite low. A consultation with a specialist will cost about $50 and you will get an appointment within a couple of weeks, not months. 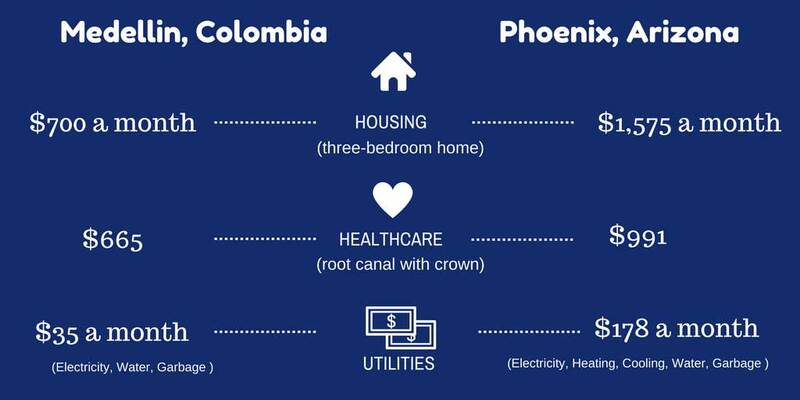 To compare: For a root canal in Colombia the most you will pay is $300, compared to $991 in Phoenix, AZ. That’s a saving of 69% if you get your treatment in Colombia. You can expect to pay on average only $35 for your monthly utilities (electricity, water and garbage). As there is no need for heating, and air-conditioning is not a necessity in Medellin, your bills will only be a fraction of what you would pay in the U.S.
To compare: Electricity, heating, air conditioning, water, and garbage for an apartment in Phoenix, AZ will cost you $178 a month. The average cost of living for a couple in Colombia renting a furnished, two-bedroom apartment, including healthcare, entertainment, groceries, utilities and transport costs is $26,292 a year. 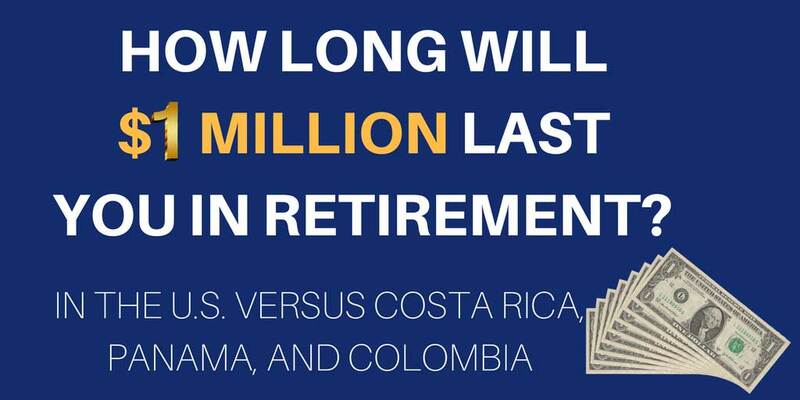 Based on that figure, if that same couple had $1 million for their retirement, they could live for 38 years in Colombia. 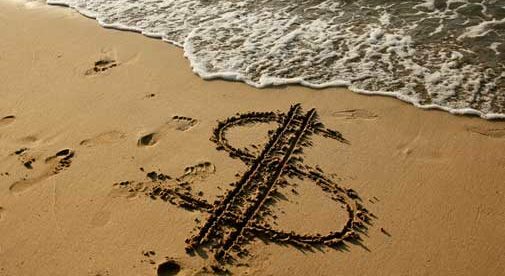 But WHY resort to any of those options when you could simply take that nest egg overseas? In many of the world’s top retirement havens, a couple can live comfortably on around $2,000 a month (that’s $24,000 a year)…and in some places that figure is even lower. It means that a nest egg of $1 million can stretch to nearly 50 years in the right places overseas. But, more importantly, it means you don’t need $1 million to fund a long and fruitful retirement in a safe place where the weather is warm year-round, the locals are welcoming, it’s easy to fit in, and you could actually improve the quality of your life while you spend less than it would cost to stay home. If you want to thrive—and not just survive—in your retirement, and if you want to be confident your nest egg will go the distance, then don’t worry about putting away $1 million or more. Instead, start thinking about your good options outside of the U.S.